Epic failure. That’s the best—and possibly only—way to describe my “fitness” class last night. Admittedly, it was the first time in, oh say, seven years that I attempted to “work out.” And of course, I chose the fast-paced, high-impact, shake-your-booty class. You know, the one that our 20-year-old brain tells us will be a piece of cake when we’re still in our New Year’s resolution phase. Seriously, though. The class taught me some valuable lessons. For starters, it reminded me that there are muscles in my body that I forgot existed. It also validated that it was not wise to try and keep up with the uber-fit girl in front of me. But, most importantly, it reiterated that giving up was NOT an option. I left feeling exhausted. Yet, I couldn’t help but feel like I had achieved something—even in what some might call a failure. It’s simple. When you fail, you learn. Failing at something forces you to think about what went wrong. And that naturally leads to thoughts about what you could have done better, or different, to make it right. How many times a day, week or month do you have that inner conversation with yourself about something that didn’t go exactly to plan? Maybe it’s about a relationship that’s not working. Or how you reacted to your kids when they whined about something. Or maybe it’s about how that business deal suddenly fell apart. What the failure is isn’t important. What’s important is what you learn from it. One of the best examples of where failure is being embraced—and even celebrated—is in schools that teach the STEM program. If you’re not familiar with STEM, it’s a collaborative, project-based program where kids use science, technology, engineering and math concepts to solve real-world problems. Students learn by doing, not by rote memorization. And by doing, they make mistakes. These mistakes help them build their problem-solving skills, thus helping them develop into creative, critical thinkers. Pretty smart, huh? If current and future employees are being taught this type of approach, doesn’t it stand to reason that businesses should adapt in ways that will support these critical thinkers? We think so. Especially since it’s estimated that in the next five years, major American companies will need to add nearly 1.6 million STEM-skilled employees. This leads us one big question: As a leader, how do you create a culture that not only supports, but also encourages people to learn from their mistakes? Let’s start by looking at five key strategies you can put into play today. First and foremost, create a space where everyone knows that it’s OK to fail. The environment should encourage risk-taking yet provide guardrails. In the case of STEM, teachers give students general guidelines for a project and then encourage them to learn through discovery. They urge them to ask questions and experiment. They ask them to explore and even come up with new methods, ideas or solutions. We encourage you to advocate for and support a culture that allows people to ask questions, try new things and, ultimately, fail. But keep in mind that there’s a distinct difference between allowing someone to take risks and someone who’s just downright defiant. Be sure to set clear boundaries of what will and won’t be tolerated. It’s also crucial for employees to know that, while mistakes are OK, they shouldn’t make the same one twice. At IronStrike, we often counsel leaders on how to use communications and other tools to help employees embrace the change they want to see. In this case, it’s employees taking calculated risks—obviously, within reason. It starts with making sure your actions mirror your words. So, don’t just tell employees they’re in a safe space. Demonstrate it through your actions and words in meetings, projects, 1:1s and performance review. And ensure that the message is consistent across all levels, from the C-suite to front-line staff. Remember the old proverb “If at first you don’t succeed, try, try again?” It was made popular by the famous British writer William Edward Hickson. This statement gets at the very essence of failure as a means of growth. Real-world learning happens best through trial and error, or what some call innovating. 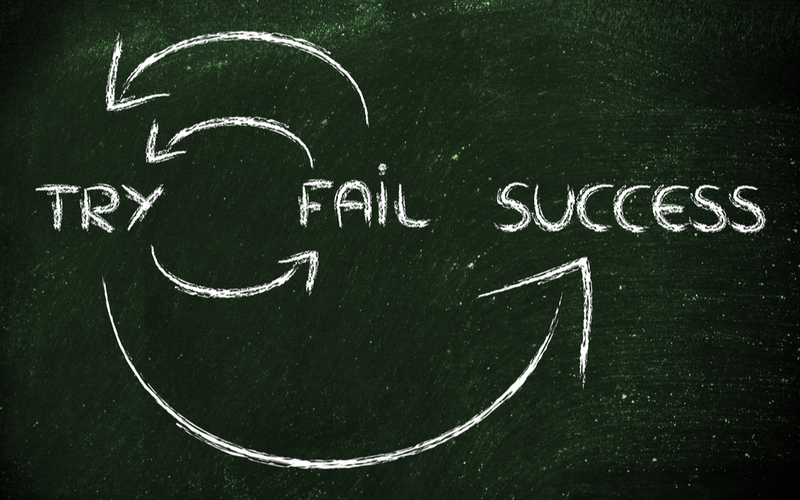 Forbes recently published a great article on the connection between failure and innovation. It’s fascinating—and comforting—to know that some of the smartest inventions resulted from failures. Knowing this, it’s your job as a leader to make sure staff can innovate in their safe space! Some ideas include giving people a way to share ideas (e.g., idea box) or creating an incentive for innovative solutions that catch fire. And we recommend reinforcing behaviors you want to see more of. So be sure to consistently acknowledge innovation efforts as part of your overall performance management. One of the hardest things for us, as humans, to do is admit to our mistakes. Ever wonder why? Maybe it’s because we live in a culture where people are often penalized for being wrong—sometimes in front of everyone and their brother. We’ve all probably experienced an episode or two of public-shaming. You know, that time when the boss called out Susie for screwing up that sales call. Or when you heard Eric getting chewed out because the door to his supervisor’s office was wide open. The good news is this type of shaming is quickly becoming unacceptable business behavior. And that leaves a glimmer of hope for more humility in the workplace. Humility in leadership is important to us. So much so that we’ve touched on this topic before. The most recent reference was in our January 2018 blogpost on motivation. At IronStrike, we believe organizations thrive, in part, when leaders are humble, admit to and learn from their mistakes, and recognize when it’s time to let go of something that didn’t work out as planned. Now, we want to take a minute to really want to drive home this last point. While you should take stock in the “why” behind the failure, don’t dwell on it. Dwelling on losses can be toxic to a team. Instead, cut your losses. And don’t lose sight of your victories. Letting go of a failure isn’t the same as giving up. Parlay that failure into something bigger and better based on what you learned. A feedback loop also lends itself to more experimenting, in part, because you can pilot a program or product for a short period of time and then make tweaks to improve it. This process can repeat itself one, two or even ten times. The founder of a UK firm stated in the Forbes article that smaller start-ups are more likely to experiment. It’s no wonder why! He went on to say that in the start-up community, entrepreneurs tend to refer to things not as failures, but pivots. We really like this as a substitute word for failure for two reasons. First, pivot has a more positive connotation in general. Second, we think it evokes an idea that the company is on the verge of a turning—or tipping—point. And we’d like to believe that more times than not, all that experimenting and gathering input results in something good. Everyone’s heard the idiom “birds of a feather flock together.” It’s a statement often used to illustrate how people who are similar tend to spend more time with each other. In this instance, we think it helps emphasize the importance of surrounding yourself with positive, forward-thinking people. People who are willing to forgo their ego and put aside their own self-importance for the greater good. People who share in your desire to work together to find that ultimate solution—even if it means you fail a time or two. And people who build you up rather than tear you down. We encourage all leaders to seek out these types of individuals and engage with them frequently. You’d be amazed at what these types of collaborative relationships can lead to in business. Finding success in failure isn’t easy. In fact, the concept alone is hard for some to grasp. It’s easy to wallow in your own self-pity when things don’t go your way. The next time that happens, remember the words of the famous Albert Einstein, “Failure is success in progress.” If anyone understands the value of not giving up, it’s him. After all, he did try 10,000 times to create a light bulb. Imagine where we’d be if he’d thrown in the towel! Speaking of towels, I think I’ll need one for my next fitness class. ‘Cause you know I’m going back! We’d love to hear what things you’re doing to encourage failure… ahem, discovery… in your organization.